Cryonics has been called "An ambulance to the future." 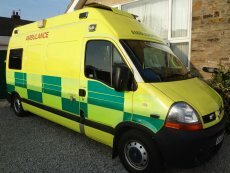 There are only a few such ambulances in the world. You can come visit, it's free of charge. Just check out our next training date. It's said that a friend will help you move, but a true friend will help you move a body. That's part of what we do. The CardioPulmonary Support (CPS) machine helps to ventilate the patient: it pumps oxygen through a tube and face mask and does chest compressions to massage the heart so that it pumps blood. The Combitube is two tubes combined: one goes into the lungs and the other into the stomach. The patient can be ventilated and given antacid at the same time. Cryonics UK members practicing injecting medications to the tubes prior to the perfusion stage of the scenario. Currently Cryonics UK use the VM-1 mixture provided by the Cryonics Institute, which was developed by CI Staff cryobiologist Yuri Pichugin in 2004. September 23, 2010; Sheffield Park Hotel. Saul Kent and Catherine Baldwin from USA' Suspended Animation, Inc. were in attendance. Cryonics UK Organiser David Styles gave a presentation on the topics of CUK and EUCRIO, showing a video of CUK training, following by tours of the CUK clinic, bulky equipment storage space, and ambulance. There was a CUK equipment show-and-tell. We were joined by people from England, Scotland, Wales, France, Poland, Finland, and America. Cryonics UK was featured in a photography exhibition The Prospect of Immortality by Murray Ballard at Impressions Gallery in Bradford (10th Jun - 17th Sep 2011). Left: Bag valve mask: face mask, carbon dioxide filter, ambu bag. Right: ambu cardiopump. Part of the quarterly training. A metal box needs to be used for shipping the patient's body overseas, enclosed in a larger wooden container. Inside there will be ice and dry ice so the container cannot leak. Ice pellets are placed around the body to help cool it down. The thumper is massaging the heart, medications are being given. The patient is ready to be transported by the ambulance from the hospital, where they would have recently died. The sprinkler system is meant to move cold water around the patient, aiding the heat removal from the body. It consists of a submersible electric pump with a flexible hose and spray head. Used to control the flow direction of vitrification fluid in the washout / perfusion kit. Tapping the pipes with the rubber hammer helps remove air bubbles. lf there are no IV lines, an intra-osseous infuser will be used to insert a needle via the chest bone. The medication will be administered via the bone marrow. Through this device various perfusion medications can added to one system, and they can be controlled one by one by closing and opening the valves. One of our training kits at the Sheffield clinic. CRYONICS UK is a non-profit organisation set in place to provide assistance to those within the UK who wish for their body to be cryopreserved upon "death". The inverted commas around the word "death" here are intentional. A couple of hundred years ago, if you stopped breathing, they buried you. As recently as the 1950s, if your heart stopped, you'd be cremated. These days, it's more likely you'll be resuscitated and sent back to work to pay your taxes. Science is constantly pushing the boundaries of what is considered "dead". By suspending a patient's body in liquid nitrogen, it is possible to prevent further deterioration of the body indefinitely. For obvious reasons, the initial cooldown is to be commenced as soon as possible after the patient is clinically dead. The intention behind this is that cryonic suspension is a sort of "ambulance to the future". Chances are reasonable that the technology required for repair will be available in the future (just look at how far humanity has come technologically in the past 50-100 years alone, and then project that forwards). You just need to be in an adequate condition to receive the benefits of those advances when they are developed. Cryonics aims to get you there. Cryonics UK is the operating name of the Human Organ Preservation Research Trust, a registered charity since 1991, reg no 1001750.